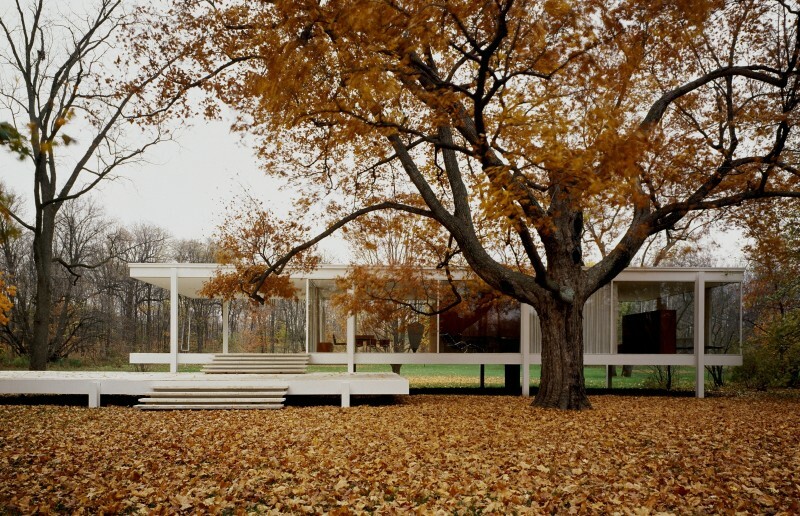 The Farnsworth House was designed and constructed by Ludwig Mies van der Rohe between 1945-51. It is a one-room weekend retreat in a once-rural setting, located 55 miles (89 km) southwest of Chicago’s downtown on a 60-acre (24 ha) estate site, adjoining the Fox River, south of the city of Plano, Illinois. The steel and glass house was commissioned by Dr. Edith Farnsworth, a prominent Chicago nephrologist, as a place where she could engage in her hobbies: playing the violin, translating poetry, and enjoying nature. Mies created a 1,500-square-foot (140 m2) house that is widely recognized as an iconic masterpiece of International Style of architecture. The home was designated a National Historic Landmark in 2006, after joining the National Register of Historic Places in 2004. The house is currently owned and operated as a house museum by the historic preservation group, National Trust for Historic Preservation.